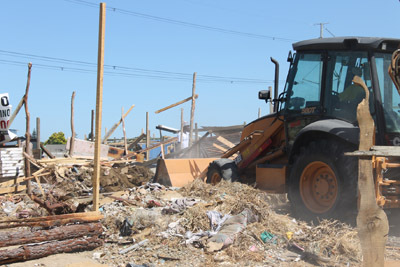 More than 1000 people were left homeless and five people arrested when the City’s Anti-Land Invasion Unit demolished shacks at Strand’s Siyanyanzela informal settlement yesterday after the EFF allegedly told residents they should build homes on open land there. According to residents EFF members told them they should go ahead and build their homes on open land two months ago, and residents said they were shocked when the Anti-Land Invasion Unit, backed up by police, came to tear the buildings down. “This is not fair, leaders said we can build the shacks and ward councillor Mbuyiselo Matha is aware of these shacks,” said resident Vuyelwa Mgodlo. The mother of five said she lost all the building material she bought last week at a cost of R1 800. ”I’m stuck here, I don’t know where to go now, my children are at school and they do not know about this. City knows we don’t have places to stay, why are they chasing us away?” she said. Mcebisi Maxhwele, whose shack was also torn down, said he could not afford to pay a backyard rent of R300 every month and was happy when the EFF told him to go ahead and build a shack on open land. Maxhwele said he was under the impression the city had given permission for them to build shacks on the land. ”For six years I’ve been paying rent after my RDP house was sold by some of the leaders. At least I managed to escaped with my things but it’s painful because I bought a new material,” said Maxhwele. ANC leaders in the area said people had been misled by EFF members. ANC branch chairperson Simthembile Mfecane said he told residents not to build shacks on the open land in question as it belonged to the South African National Road Agency. But EFF leader Mphathisi Tshitu, said residents needed a place to live and the space was open. He said most people could not afford to pay rent.